Your a great author. Keep the podcast coming. Please and Thank You. Hands down Rossi is my favorite author. Welcome back. Mr Rossi is one of the very best in the podcasting world. Great stories combined with an awesome narriating voice leave you wanting more even as the book is coming to its last few pages. Crescent, was one of the few books that have ever elicited an emotional responce from me,,,,, fear. Listining to this combination space opera/ horror fest will have you sick with apprehension till the very end. I don't know why Stephen King makes all the money....this guy's writing is way better! Listen to it and all his oter books. Phil Rossi scares the heck outta me. Horror that freaks you out! Phil grabs you by the balls from the beginning and doesn't let go. I joined late, so I have been burning the midnight oil to catch up. I recommend it without reservation. Just finished "Harvey". Phil is one sick and weird mofo. I don't know how he sleeps with this stuff rattling around in his head. I could only listen to it during the day to avoid the creeps and skin crawling. Amazing!!! Harvey needs to be made into a movie. I've only listened to Harvey so far in this collection of novels. Amazing!! I listened to it every day to and from work. Mr. Rossis' words lifted from my ipod and morphed into a movie in my minds eye. Definately made my commute shorter. Harvey needs to be made into a movie. Kudos to you Mr. Rossi. I can't wait to see what else you have to offer. Thank you for all of your hard work. Every hair on my neck stood on end! Phil Rossi is a master tale weaver and this tale is a masterpiece. I will probably listen to this tale over and over. Yeah this is THE way to write a podcast!! Take notes and buy Cresent! I've listened to Crescent, and have been thoroughly enjoyng Harvey. Rossi is great at developing characters that you come to feel like you know, and then putting in them in some seriously f*cked up situations. It's not just a mash-up of writers who have come before, but something new. Keep it up! Mr. Rossi can tell a tale and spin a yarn like no one I have ever heard...he is, in my opinion up there with Stephen King,Clive Barker,and Scott Sigler! Harvey is the one story that has been able to actually make its way into my dreaming mind and reak havoc!!! To that I say thank you Mr.Rossi and I tip my cap to you... it takes alot to screw with my mind. AWESOME!!! Ok Mr. Rossi I’ve gotten out of crescent station alive I’ve seen the beauty of Eden. I know I can crawl out of a small town. Bring IT! This is the best quality and content of any podcast on the internet. Phil is a terrific writer. Enjoy it now, soon Phil will be famous and you will have to pay $40 to purchase the audiobook. Phil's voice is fantastic and these stories are scary, intense and thoughtful. Well written, well read sci-fi story. Mr Rossi does a good job of building a spooky environment and making us care for the characters. The story takes place in orbit around neptune a few centuries from now. But for those that hate sci-fi, don't fear. The story isn't heavy on sci-fi and it is barely noticeable. It could have just as easily been a spooky story set on a southern plantation with a minimum of changes. I gave it 4 stars instead of 5 because, although I thoroughly enjoyed it, it could easily have been (and should have been) twice as long. But, regardless, d/l this podcast and treat yourself to a good, old-fashioned, ghost story. slightly disturbing - love it! Once again Phil manages to write something that can send chills down your spine. Coupled with the music score written just for this podcast and you've got one creepy suspenseful ride. I encourage everyone to give it a listen. Phil Rossi is a god of the Pen and Paper!!!! Words cannot describe the caliber of his writing. I wait on the edge of my seat for every twist and turn of his mind to tingle my spine and invade my nightmares! This author and his books (Crescent, now this) totally grow on you quick. I find myself thinking about them ALL the time. They definintely have their own unique charm, and the authors voice and style only add to the coolness of them. "Crescent" is good: intriguing, gory, a little scary. I liked it enough to recommend it. The real jewel is the author's voice and speech pattern. Wow!!! It deserves 5 stars. I usually listen to books at night to wind down and sleep. Phil Rossi can talk me to sleep anytime! Phil does great job tell his story. With a brillant his narrative voice and awesome back ground music. He give us have tell tale of scifi and suspese. I have been hooked on Phil's works since I listened to the first minute of Crescent. If you haven't downloaded it yet, DO IT NOW! IMHO, he beats Sigler, Hutchins, Lafferty, and all the other big name podiobook types. You will not be dissapointed. Seriously. Everyone I have gotten to listen to Phil's work has been hooked. Download it now! This has all been said but I must say it again. 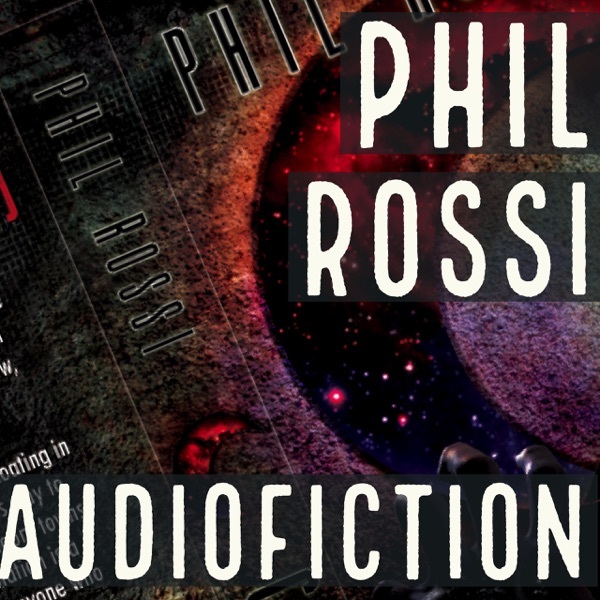 Phil Rossi is not only a talented horror writer but also an extremely talented vocalist. Just download and listen. You will thank us for it later . . . The stories that escape from Phil Rossi's Vault will entrance you and frighten you. They're not for the faint heart either. The writing and production values are excellent, and as long as you're willing to be lead down scary dark passages you'll have a wonderful time listening to Notes from the Vault. I love everything Phil does. His voice really grabs you and brings you into the story. wow! the notes from the vault series has really exceeded my expectations of how creepy any podcast can get! i don't even have to set the mood or anything, i listen to podcasts at work, at home, at the gym...Rossi never fails to send shivers down my spine with his latest. Excellent podcasting. So entertaining, engaging and well-produced! Some of the best sci fi out there. Seriously this is not just a good scifi horror podcast. This is a damn good scifi period. Someone make this into a movie because it kicks the crap out of anything hollywood is putting out that dares to call itself horror. Highly recommended! Phil knows how to tell a good story. Gets quite creepy at times! Highly recommended if you like to be spooked. I highly recommend this to anyone!!! Captivating story that will keep you on the edge of your seat waiting to hear what will happen next. Phil Rossi has some really great characters and pulls you right on to the space station with them. Creepy and Humorous! Crescent was my first ever podcast that I listened and what a treat it was! Phil Rossi sets the standard high in the genre of podcasts and I look forward to listening to more of him, hopefully in the near future. Crescent is a unique story that is performed incredibly well - the narration is accentuated with great music and sound effects and the author pulls off the voices of each character without a hitch! Crescent is good story telling - You won't be bored. I like this serial a lot and have given up on at least four other slightly more touted Podcasts. Phil Rossi is a good author whose Crescent characters are interesting and seem genuine. Being a Sci-Fi fan, I obviously like the setting but appreciate that the story doesn't over indulge in gadgetry, techno babble, et al. Phil also does a good job in pacing the story line in a serialized fashion. He is writing for his medium and the audience is the beneficiary. Thanks Phil. I recommend others give this one a try. I haven't been bored yet. Phil Rossi is an extremely tallented writer! That is a total understatement, as his podcast production is second to none (sorry Scott Sigler!!! still love your podcasts too lol). This podcast reminded me a lot of event horizon, only with the terror factor magnified about 2500 times! Don't wait, download now and get sucked into the Crescent phenomenon!!!!!!! This is an exceptionally well put together podcast book - production value is so high it makes you feel like you're right around the corner, off Main Street, on Crescent. I'm totally hooked even though I usually go for the straight SciFi stuff without the horror. Very captivating story and Rossi's narration is superb with a blend of accents and voices for each different character. Wow. I'm very impressed - certainly NOT for the faint-hearted, though. I will be eagerly awating Rossi's next venture. This is hands down, the best audiobook I have ever listened to. The story is top-notch and the production is flawless. Production value is ver high. The story is not for the squeamish, but this podcast is for adults who like horror stories and don't mind gore. I also recommend this podcast to any podcaster who wants to know how things need to sound to draw listeners at a record pace. Amazing Podcast. Easily on par with Children of the Gods or any of Scott Sigler's stories. Truly truly enjoyable. However there is one drawback...I came across this podcast before being completely finnished and all episodes have been released, and thus I am forced to wait............. Anyways awsome work Mr. Rossi keep up the good work! Excellent mix of horror and suspense in a "well-grounded" scifi setting. Phil makes the environment believable and the story gripping. The weekly installments are frustrating for someone who reads a scifi book in 3 days, but the narration and sound effects are worth listening to the podcast.